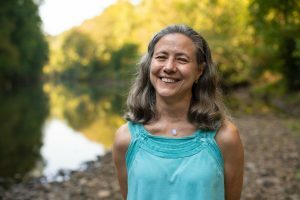 Beth K. Stewart has been Executive Director of the Cahaba River Society since 1995, and grew up in the Birmingham area. In addition to leading organizational management and community relations, Ms. Stewart contributes to the Society’s programs providing policy advocacy, education, and collaboration for low impact development, storm water, drinking water supplies and efficiency, and faith-based care of creation. Beth has a Master’s Degree in Landscape Architecture from The University of California, Berkeley with a focus in urban and environmental planning. She worked in the local government planning and zoning field for 15 years in Birmingham, New Orleans, the San Francisco Bay Area, and the Bluegrass area of Kentucky, where she was the first full-time planning director for a small, historic county seat that became the location for a major Toyota plant. Beth was co-founder and executive director of the statewide nonprofit Kentucky Waterways Alliance and has been a private consultant on planning projects for historic preservation, land use, river protection, greenways, agricultural preservation, heritage tourism development, and coordination of state agencies. Beth helped found the Interfaith Environmental Initiative of Alabama, co-leads the Alabama Urban Stormwater Partnership, participates in the Alabama Department of Environmental Management (ADEM) Reform Coalition, and has served on 2 state task forces for environmental strategic planning. She is a member of Leadership Birmingham Class of 2002 and received the 2007 River Hero Award from the Alabama Rivers Alliance.